Since phpStorm 6.02 EAP Build PS-129.395 on OS X 10.7.5, errors "Member has protected access" are appearing. I use Contao (contao.org). Many classes extends the abstract "Backend"-Class. The constructor is protected. In the in childclass, the call parent::__construct() trigg the error. (see attachment). The same errors appears also in dynamic calls like $this->blablaMethod() from other extended Classes. Maybe I missunderstand something, so before I send a Bugreport, I will ask in the community: Do you have an explenation for this attitude? The same code opened with phpStorm 6.01 there are no errormessages at all. Who is that "together" guy? Please try "File | Invalidate caches..."
Sorry, I had stored your name wrong. I invalidated the cache, no change. I created a new project with only 2 files. Class Backend and Class tl_article extends Backend. With the same, original code. No change. Same error. But I tried to find a solution and add the maybe missing "namespace=Contao;" in the head of tl_article Class. After this, the error disappeared. I'm not a namespace crack. But it could be a solution; but it's a too heavy workaround: There are so many files without namespace tag because Contao is the default namespace. It is absolutely crazy: The class tl_file has the absolute identical code for the __construct()-Methode also in the method itself. The same extended class Backend, also no namespace line like tl_article, BUT NO ERROR!!! I can't understand. 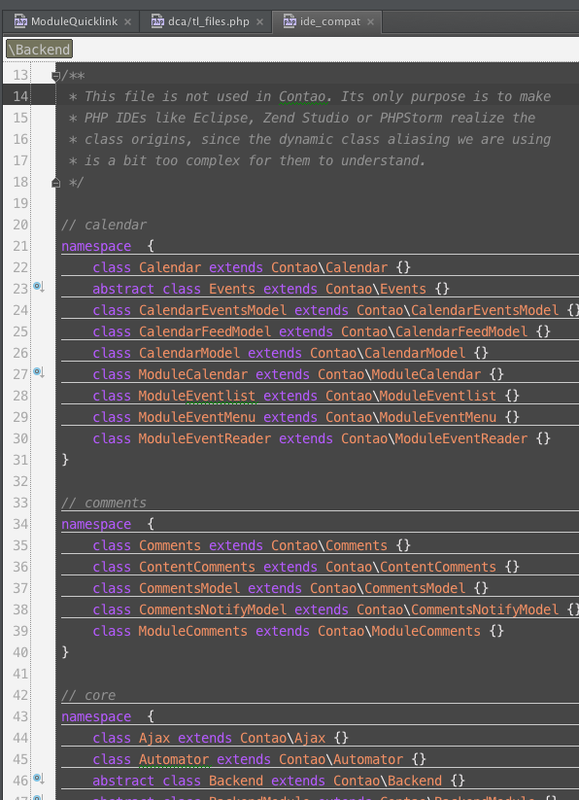 So for the first I reuse the phpStorm 6.01. Maybe after the EAP-phase it will be changed. I hope ?:|. Or maybe someone else will have a hint. Please attach these problematic files (so that they can be copied to another computer to reproduce the issue). You can delete not important methods -- just leave the code that reproduces the issue in new empty project. I restarted 6.02 EAP and in the testfiles there are no errors. Back to the before no-Error marked File "tl_files.php", now there are errors too. It seems obvious. I think it will the missing namespace=contao; line in all the "tl_*" files. Maybe it have to change from the contao-Project. Strange, in the 6.01 no errors and the code works. But maybe php isn't such strict like phpStorm. Maybe there is an fallback for missing namespace declaration... Who knows! I will not be the onlyone with this problem in future. Some Contao core developer work with phpStorm. I hope they don't will stay on phpStorm 5.X. But I think no. Thank you for your help. And excuse this faults. Maybe phpStorm 6.02 ignore an workaround from Contao. There ist a file ide_compat. It should route the namespaces to the right direction. Maybe in 6.01 it works and in 6.02 it doesn't work. I send an Message to the Contao-Board. Perhaps there know someone an solution. Maybe you can see an other viewpoint with this print-Screen. I don't know, but maybe there is the problem. I'm extending a class containing a Method say "protected myMethod()"
When using this Method several times within my extension class I'm getting the error on an arbitrary usages of this method. Say I use it three times then sometimes I get the error not at all, sometimes on one, sometimes on two other usage points. That is the point !!!! Thank you Andriy and Maximilian. Contao creates a cached file, from the file that has the problem with the error "Member has protected access". If I delete fhis cache-file, the Error disappears. The existing of this cached file was the reason, why the error appears sometimes and sometimes there was no error. Maybe jetBrain will develope a better solution. But now, I can work with the newest phpStorm. Thank you for your help. Now, there is grow up a new problem. Is there a way to exclude directories from the error-search-process without to exclude the file from the project? Because, the errors are gone away, but know in the project-view I can't see the files in the exluded directory. So I can't open or manipulate them. Maybe there is an other way, not such all-embracing.